Lysaght worked with the management of a leading public school in Queensland to provide essential shelter and facilities to their students. Located in the Brisbane suburb of Mansfield, 11 kilometres from the city’s CBD, the Mansfield State High School is a co-educational, independent public school reputed for their academic performance; the school was named both Regional Winner and State Finalist for School of the Year in Education Queensland’s 2016 Showcase Awards for Excellence in Schools. Mansfield State High School and their dedicated P&C Association work hard to ensure a safe, supportive and comfortable learning environment for their students. Therefore, the school sought Lysaght’s assistance over the 2017 Christmas break to provide good quality shelter to their 2,600 students to keep them sun-safe in sunny Queensland. Lysaght’s smart solutions met the constraints of both limited space and budget considerations while delivering essential structures. 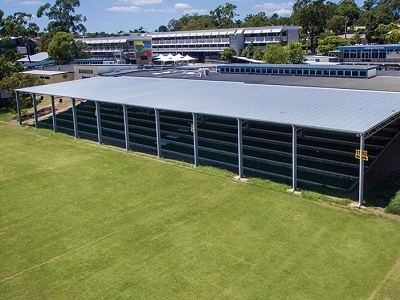 As Business Manager at Mansfield State High School, Ms Sandy Ebert oversaw the entire process and was extremely impressed with the support and solutions provided by Lysaght for multiple roof structures and a large deck adjoining the school’s canteen. Ms Ebert describes Lysaght as ‘very solution-based’ for their ability to provide flexible solutions for every requirement from roofs to covered walkways while also working within the school’s budget constraints. Lysaght Segment Manager, Marko Lalovic explained that Lysaght’s goal, as always, was to provide technical advice and support on the project from start to finish, as opposed to being just a materials supplier, while delivering products with an aesthetic appearance and spanning capabilities far surpassing conventional zinc and galvanised structures. For the latest requirement, Lysaght determined the school’s needs, conducted the initial site visits and site measures, custom designed the structures, co-ordinated material production and materials supply, sourced external materials, co-ordinated with builders, engineers and installers, and also performed final site inspections. For the tuckshop deck and its associated covered area, Lysaght provided a complete LYSAGHT Kitted Structure, supplying Orrcon MAXI-TUBE, Lysaght SPANDEK cladding in the COLORBOND steel colour Surfmist, Lysaght FIRMLOK beams in the COLORBOND steel colour Monument, plus Lysaght COLORSCREEN in the COLORBOND steel colour Monument to screen the substructure beneath the deck. Additionally, Lysaght supplied TRIMDEK cladding and purlins to create a shelter over a stepped seating area for student spectators next to the school’s sporting fields, along with Lysaght TRIMDEK cladding and Lysaght FIRMLOK beams to extend a covered area to provide shelter for students waiting for the bus. Lysaght’s professionalism also assisted RHM Building Innovations, the contractor on the recent Mansfield State High School projects. With 17 years of experience designing and constructing commercial, domestic and industrial steel sheds and buildings for clients in South East Queensland, the family-owned company prides itself on using quality 100% Australian BlueScope materials and has worked closely with Lysaght for the past five years. RHM Building Innovations Director, Darren Martin is happy working with the Lysaght team because of their accommodating nature and problem-solving capabilities. Describing their partnership as supportive and professional, he added that Lysaght’s service and support made all the difference.